I saw this post a few months back & got so excited. You & I are never happier than when we have sand between our toes. 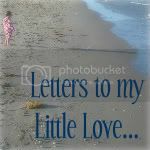 Could we really make your adorable, little footprints in the sand? With you turning five this year, I thought it would be incredibly sweet if we could forever capture your five year old feet & toes. In order to get as close to five-year-old-ness as possible, I decided to make this around the holidays & include your best friend. I knew her parents would love her footprints in the sand too. I bought enough supplies for two. The first thing I did was lay down a sheet to catch the sand & plaster mess as we worked. I put our two frames on top of it. Not thinking about how the plaster would need 5 hours to dry, I lay the sheet down in a heavy traffic area of our home. That was my first rookie mistake. Trying to keep little feet & paws from knocking into the frames as they dried would have been almost impossible. I removed the frames' cardboard backings & glass (the glass isn't needed). Next, I placed the backings on the front of the frames & flipped them over (this video tutorial might better explain). The directions in the original post said this makes a "nice box" to fill the sand into. Except, it is not a nice box. One bump or shift in the frame makes the sand spill out, & you have to fill & smooth the sand all over again. If I were to do it over again, I would have taped the cardboard backings to the front of the frames to create a loose seal. 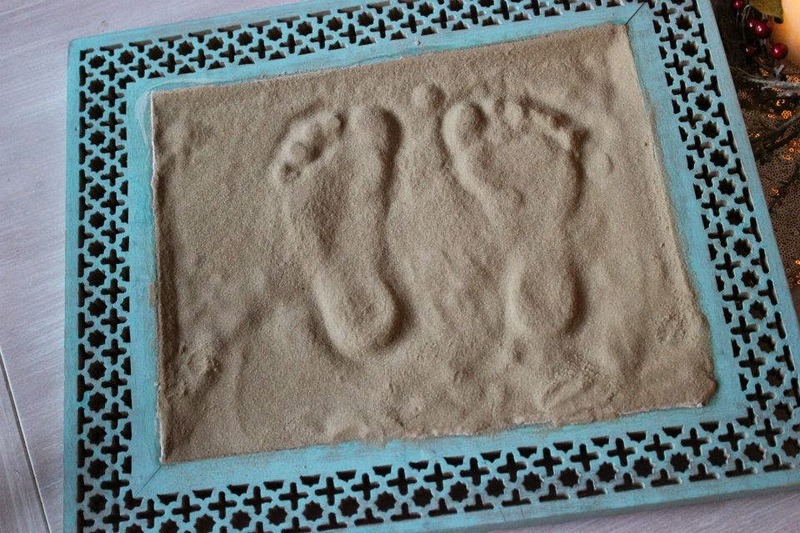 I filled the frame with sand from the craft store, & used a piece of cardboard to level & smooth the sand (the directions says to fill to where the glass would have been but I missed that part & likely used way too much sand). Next came the hard part, catching your footprints. Your best friend went first. It took her only a couple times to make a nice impression with her feet, re-smoothing the sand each time before we tried a new print. I had to remind her to pick her foot straight up, slowly & gently. 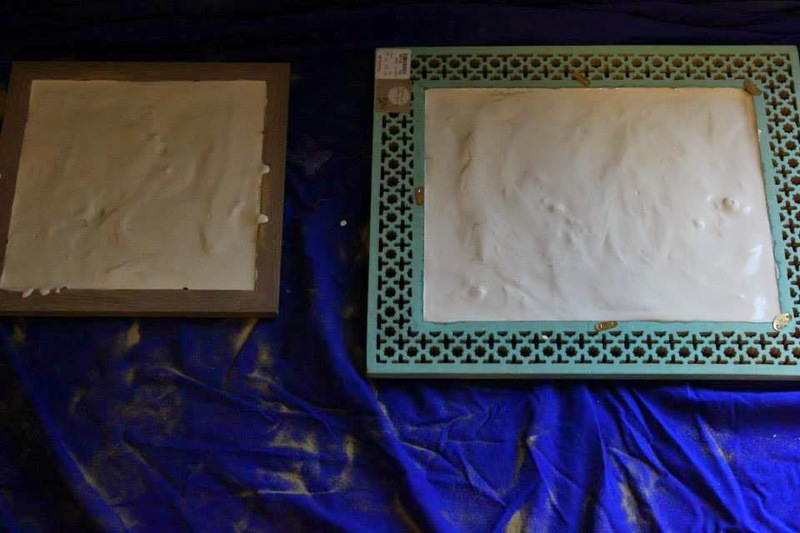 Once I was happy with her prints, I began mixing about 1kg of the Plaster of Paris per the instructions on the box. I tried to pour the mixture gently & slowly (as was instructed in the post), but it's really hard to pour Plaster of Paris gently. It kind of globs down as it goes. I started in one corner & worked my way across the whole frame. Then I used a spoon to softly & gently level the mixture & ensure I had covered the entire frame. At this point I was really afraid I had ruined the whole thing, only I wouldn't know it for five hours, when it dried. Then it was your turn to come to the next frame to make your footprints. I asked Daddy to begin stirring the Plaster of Paris for your frame as we worked on your prints. The problem is that slow & gentle are just not words that you understand. You stomped into the footprint making experience, making me reset the "nice box" each time time you banged the frame & sent the sand pouring out. 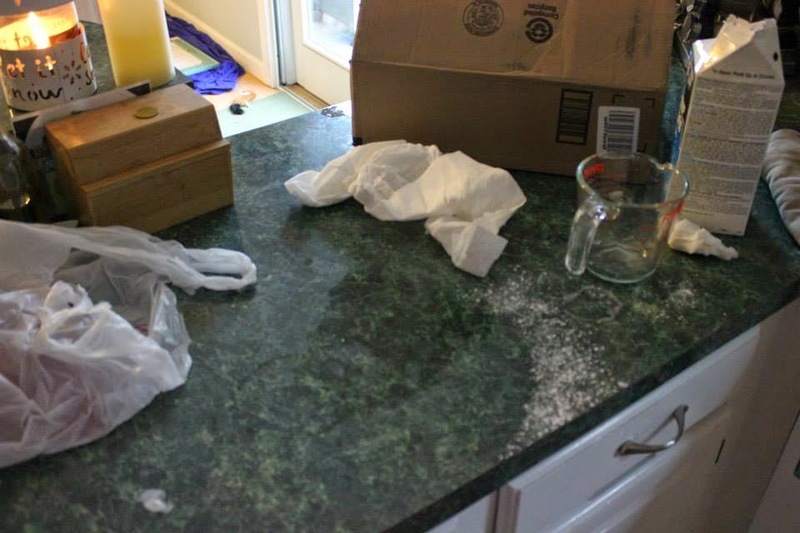 After ten tries, your Daddy walked over to see if he could help guide you into more gentle footprint making, leaving the Plaster of Paris he was mixing to set in a bowl on our kitchen counter. I don't know how many footprint making attempts there were. There were too many to count. During the last one, you somehow toppled over. Your hand landed in the best possible spot...right in the middle of your best friend's frame. Since we were supposed to be careful not to put too much pressure on the plaster, I was pretty sure your firm hand print right in the middle of it was the end of poor S's footprint. That was truly the perfect moment for your daddy to chime in. "Julie, something is wrong with this plaster," your Daddy referred to the Plaster of Paris he was supposed to be mixing. "Its not fluffy like the last time. It's really hard. I don't know what is wrong with it." I glared at your poor daddy. Nothing was wrong with it. It was doing what plaster does when someone is not stirring it (like he was supposed to). It hardens. At this point I may have lost it a little. Plaster & sand covered our house. They were all over the frames, the sheet, the floors, the counters, & you. 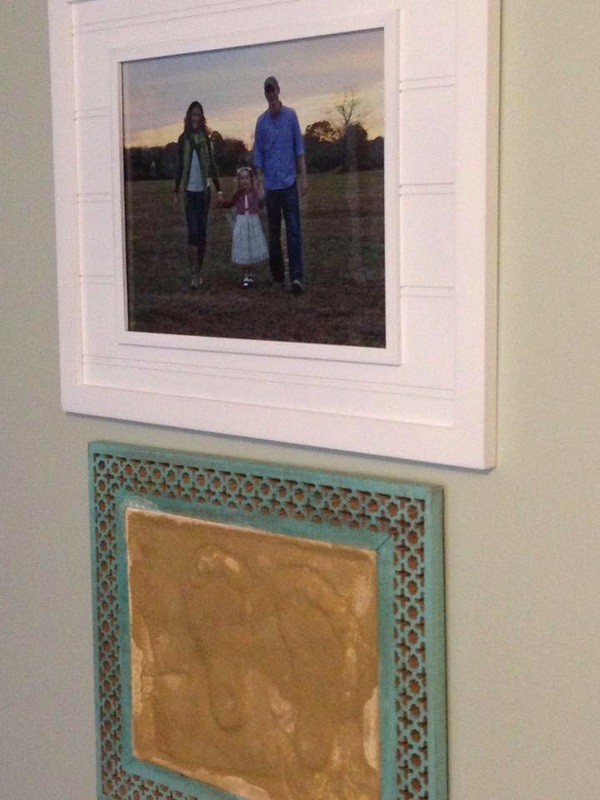 I may have run outside in the pouring rain & threw the sand & plaster contents of both frames into the woods. I'm pretty sure I returned with crazy eyes. "That's it! We're done! Everyone just go play someplace else!" You all ran away scared. I guess adults can sometimes throw tantrums too. Except I really wanted your forever footprints in the sand. Sigh. So, I cleaned up a little. I moved the sheet & the frames into a more secluded part of our house before refilling them with sand. Then I asked you & your best friend to come down one at a time to make your footprints. You did better the second time around (it only took five or six tries). After the footprints were done & you both had gone back upstairs to play, I mixed & poured the plaster one by one. I was still worried I was ruining the footprints as I poured the plaster, but I hoped for the best. After five hours, I lifted up the frames to see the results. Sand poured out, & I had footprints...but they weren't the lovely & perfect footprints from the post I had originally seen. There were some markings in them & around them. The sand hadn't adhered to prints as evenly or as much as I would have liked (I think I had filled the frames with too much sand?). I sprayed multiple coats of large amounts of Mod Podge sealant, but it's not a sturdy seal. Sand continues to fall off here & there, sometimes in clumps, revealing pieces of the plaster. 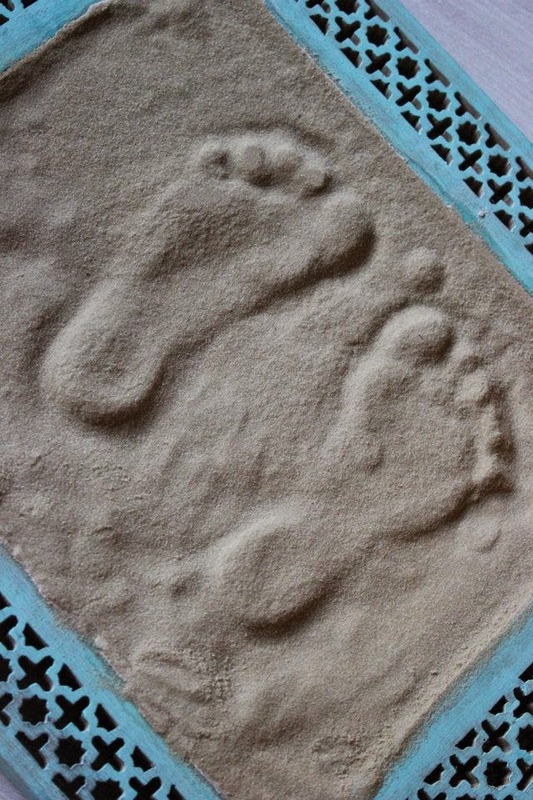 Instead of footprints in the sand, it looks like footprints in plaster with sand mostly covering them. Our imperfect footprints hang in the Family Room. There are enough inconsistencies & areas that look a little wonky that it makes me & my type A personality a little crazy every time I look at them. I want to say that if I had to do it all over again, I wouldn't do it at all, but I know that's not true. Even as I write this now, I'm wondering if we tried it again if we would have better results. The possibility of having your little footprints frozen in time is just too much amazingness for me to let go. 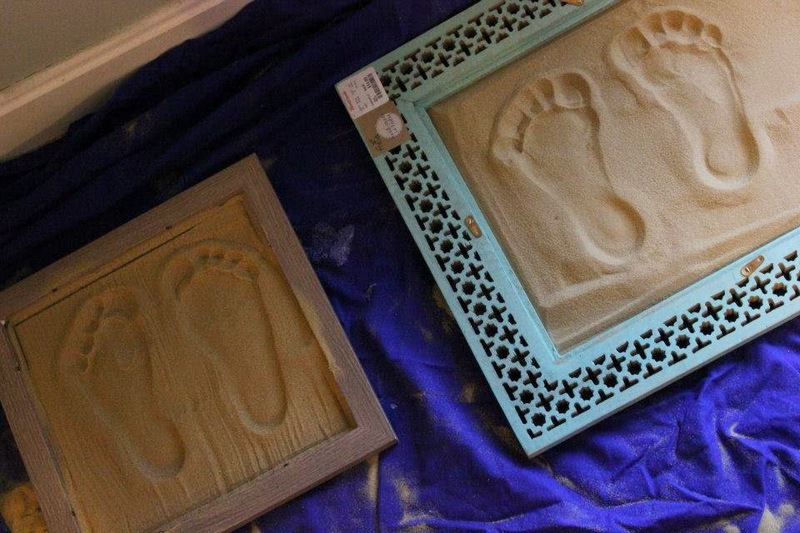 I think what I really wish is that I had never seen the Sand Footprint Craft post at all. In this case ignorance would have been bliss for everyone, because I'm already thinking...maybe after the holidays...maybe we could try again. You & Daddy should run for the hills.